"A strategy fantasy card game." 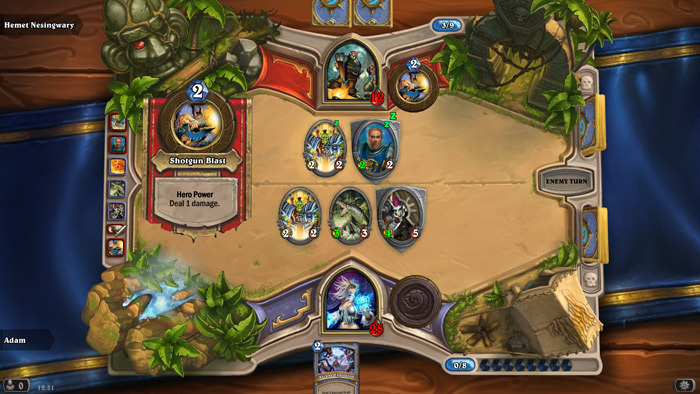 Hearthstone heroes of Warcraft is a fantasy card game. This game is very pretty the cartoon like graphics are well animated and it is rather pleasing on the eyes, the sound and soundbites are quite fun if a little tedious after a while. Hearthstone Heroes of Warcraft is a card game, drawing random cards which feature different minions or spells that can be used to attack your enemy and his or her minions, there are a wide range of different cards that can be drawn and some can do heavy amounts of damage to your opposite player, the game is playable enough and enjoyable but inherently relies on luck to win it rather than skill, for example if you draw a card that can do anything above 6 damage to your enemy the chances are you will definitely win. You start off with games against a couple of lower rated enemies which is a nice way to ease you in to the gameplay and strategy but that you are almost guaranteed to win by a huge amount, from the 3rd character onwards it becomes a little more challenging and you will have to rely on some good fortune to start getting you past these stronger opponents. If you are in to these kind of magical card games then I am sure you will enjoy this free download but I couldn’t help but feel this would work better as a board game to play with a friend and have some real interaction rather than the slightly repetitive sound bites. 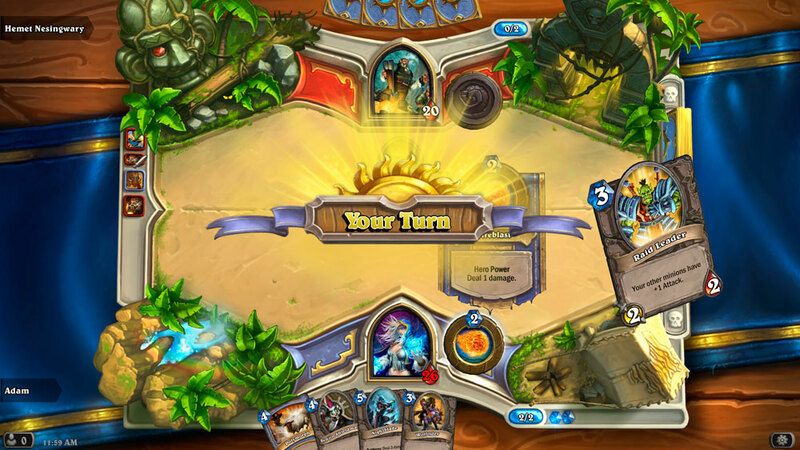 That said you could do a lot worse than passing some time with Hearthstone Heroes of Warcraft and it’s worth checking out, it’s not going to rock anyone’s world as being original or something incredibly innovative but all in all it’s not bad and also it’s free. 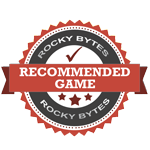 On the advice of a friend I spent sometime this morning really getting in to Hearthstone Heroes of Warcraft and I am increasing the rating from 7.2 to 8.5 and am considering giving it a recommended game award. On first review of this game sometime ago it was perhaps a little overwhelming and perhaps time constraints prevented us from really giving it the in depth review it deserved, I remember personally becoming stuck in one of the AI matches you must complete before you can play against real players however today I got past that point so that real world players could destroy me and loved every minute of it. Once you have a complete understanding of the game it is much more enjoyable and that is why the hard tutorial is there to prepare you for the real online players because those guys know exactly what they are doing! 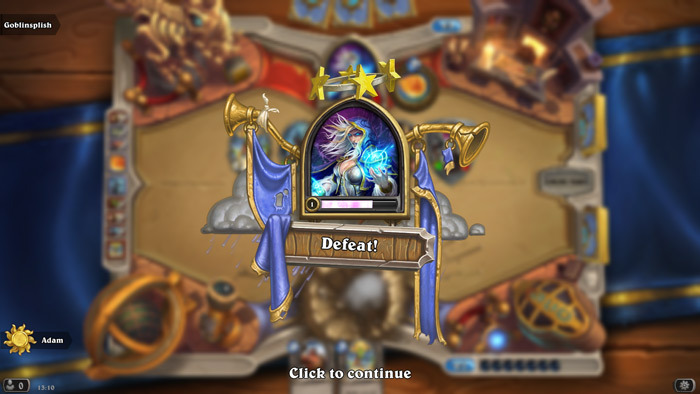 As far as free games go Hearthstone must be up there in the bracket with Dota and League of Legends as one of the best around, it looks fantastic and has really addictive game play.